India’s largest IIM in terms of number of students, Indian Institute of Management Indore is pleased to announce that it has received its first international accreditation from the Association of MBAs (AMBA, a UK-based accreditation agency), for four of its full-time programmes – Two Year Post Graduate Programme in Management (both at Indore and Mumbai), One Year Full Time Executive Post Graduate Programme in Management (EPGP) and Five Year Integrated Programme in Management (IPM, 4th and 5th Year). IIM Indore’s EPGP is accredited under the MBA category, and IIM Indore’s PGP (Indore and Mumbai) and IPM (4th and 5th year) under the MBM category of AMBA accreditation. 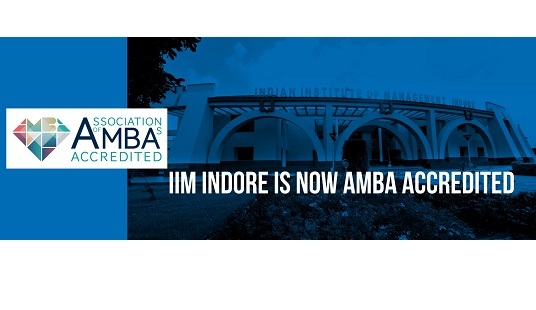 IIM Indore is now among the few B-Schools accredited by AMBA in India, and the 4th IIM in the country receiving this prestigious accreditation. In the short span of 20 years, IIM Indore has been an innovator, being the only IIM to offer a five year integrated programme in management, and Post Graduate Programme and week-end Post Graduate Programme for Working Executives in Mumbai, and the first IIM to offer a doctoral programme in Management for working professionals.